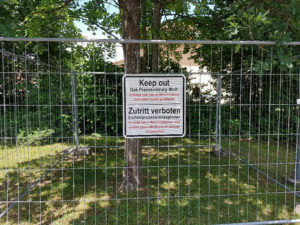 GRAFENWOEHR, Germany — U.S. Army Garrison Bavaria authorities request community members to report any nest findings of Oak Processional Moth caterpillars and keep their distance from the locations. The Oak Processionary Moth (Thaumetopoea processionea), or Eichenprozessionsspinner in German, is a tree defoliating pest that poses health risks to humans and pets in their larval stages. A long black stripe down the back of a yellowish white body, covered in gray hairs makes them easy to identify. The caterpillars each host thousands of long, barbed hairs, containing a toxic soluble protein called thaumetopoein. Contact with the hairs can cause symptoms such as inflammatory skin and eye irritations lasting between three to six days. In some cases, severe allergic reactions to skin and respiratory systems or anaphylaxis can occur. In the event of exposure to thaumetopoein, it is imperative to wash the affected area and clothes immediately. Consult your local health clinic for appropriate treatment of any persistent irritations. If severe allergic reactions or asthma attacks occur, seek immediate emergency medical attention. Oak Processionary Moths lay eggs in July and August high in oak trees, hibernating until April when they emerge as caterpillars to feed on the first leaves of spring. From April to July, Oak Processionary Moth caterpillars reside in bundled nests around oak tree trunks and branches, forming trailing nose-to-tail lines as they move locations through the tree. As a general precaution, community members should refrain from sitting under, playing and walking near oak trees, and wear appropriate outdoor clothing in wooded areas. Keep all persons and pets away from caterpillars and nests. If a tree exists with a known nest near your home, keep all windows nearby closed to prevent the hairs from drifting indoors. Removing Oak Processionary Moth caterpillars and their nests requires the use of special equipment and safety gear. Do not touch or attempt to remove the caterpillars, their nests or eggs. 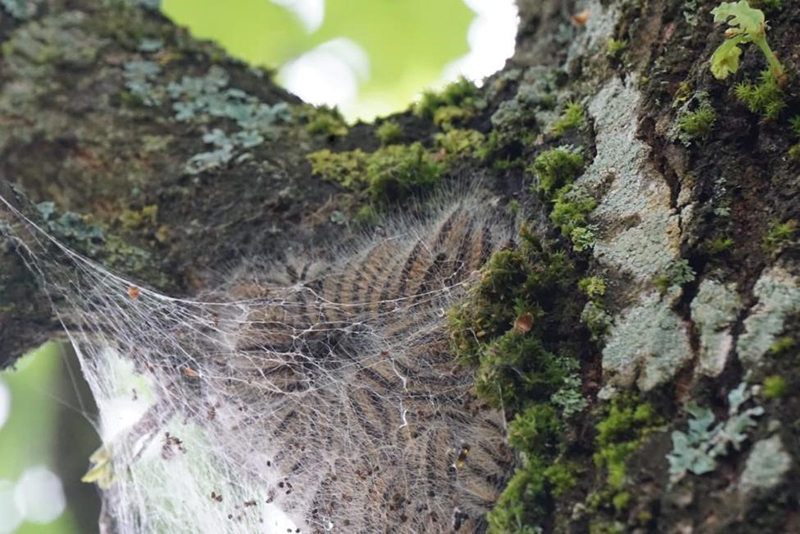 Report Oak Processionary Moth caterpillar nests by calling the customer service desk at your installation at DSN 475-6324 (Tower Barracks), 476-2705 (Rose Barracks), 466-2752 (Hohenfels) or 440-3555 (Garmisch). Learn more by viewing the U.S. Army Public Health Command Region – Europe fact sheet.